Calculator HD is designed for everyone looking for that extra in a Calculator; it has both Basic and Scientific functions, history recording, 3D buttons, easy to read and use. 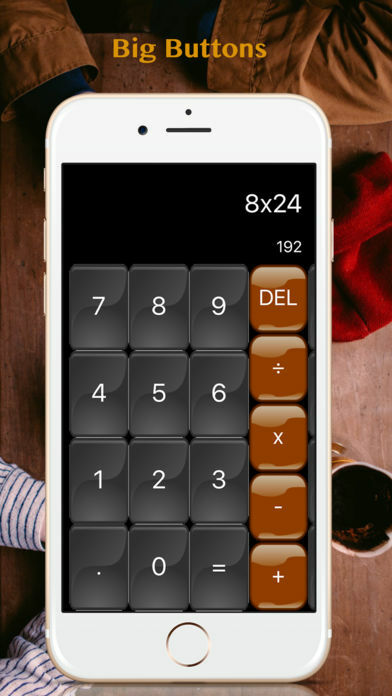 For simple calculations it is the perfect substitute for the accounting calculator, flipping the device turns it into a scientific calculator. Powered with a Basic and Scientific Calculator, it provides all basic, scientific and arithmetic functions. 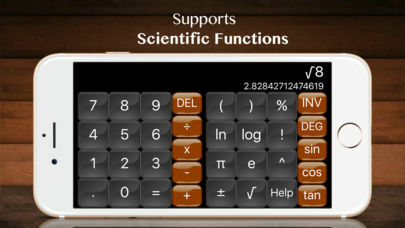 Hold your device in Portrait Mode for the Basic Calculator, and find the Scientific Buttons in Landscape Mode. All operations like factorial, exponential, divisions, root, power and logarithm are supported. Including trigonometric functions like sine, confine, tangent, arcsine, arccosine, arctangent and more. The expression view allows you to keep track of your equation and the history overview shows your past calculations. Copy your past results or the entire calculation, or delete the calculations you won’t need anymore with a swipe. You will never lose track of your numbers anymore! -Basic & Scientific functions . – portrait for simple and landscape for Scientific functions . -You can also Swipe left or right on the keypad to switch between basic and scientific keys . -No in app Purchase !